Shime Saba is mackerel cured with salt and rice vinegar. Infused with the aroma of refreshing shiso, this Shime Saba is a crowd pleaser dish. 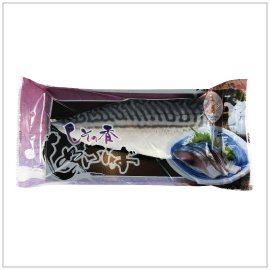 Ingredients: Mackerel, Sugar, Sorbitol, Acetic Acid, Vinegar, Malic Acid, Monosodium Glutamate, Citric Acid, Succinic Acid, Shiso Flavor, Sucralose.